A handsome 2004 chestnut gelding by Magnum Psyche and out of the Brass daughter Ames Mirage, Ames Image was the 2005 Region 17 Champion Arabian Yearling Colt. 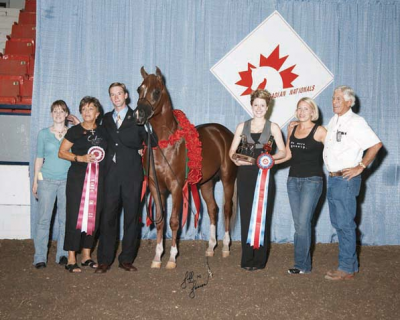 He continued being shown in-hand, winning the 2006 Canadian National Championship title in the Arabian Two-Year-Old Colts class. In 2007, Ames Image was Top Ten at both the U.S. and Canadian National Championships in the Arabian Futurity Colts Breeding class. In 2009, he began his show career in the Western Pleasure division and was named to the Top Five at the East Coast Championships in the Arabian Western Pleasure Amateur Owner to Ride Championship class.